Arsenal are scheduled to host Crystal Palace in tomorrow's London derby at the Emirates Stadium. Arsenal will make a move to sign Fortuna Dusseldorf striker Benito Raman in the summer transfer window, according to multiple reports. The talented 24-year-old, who is comfortable playing as a lone-striker or on either flank, has been monitored by the Gunners' scouting network after an impressive haul this season for his German club. Arsenal manager Unai Emery has confirmed that Aaron Ramsey will be sidelined for 'some weeks' after picking up a hamstring injury during the second leg of their Europa League quarter-final clash against Napoli. Fiorentina midfielder Jordan Veretout has emerged as the prime transfer target for Arsenal as they seek to replace Aaron Ramsey in their ranks during the summer. Arsenal's on-loan midfielder Denis Suarez is likely to leave parent club Barcelona at the end of this season, however it is expected that the Gunners will not make a permanent transfer for the playmaker. Suarez instead could move to Serie A, with Arsenal's Europa League quarter final rivals Napoli said to be interested in a permanent deal. Arsenal are understood to be planning an approach to sign Fiorentina midfielder Jordan Veretout as they seek to replace Aaron Ramsey in their ranks this summer. According to the Daily Express, Arsenal are desperate to make a move for James Maddison of Leicester City and the club are ready to spend £30 million to secure his coveted signature. The young Englishman, formerly of Norwich City, is one of the best talents in the Premier League and has been in good form so far this campaign. Arsenal are to make a free transfer move for Charlton Athletic midfielder Joe Aribo in the summer, with the player's contract at the Addicks set to expire on July 1st. The 22-year-old has impressed so far this season in League One, catching the eye of numerous Premier League suitors. Arsenal are reportedly said to face competition from Chelsea and Napoli in the race to sign Nicolo Barella from Cagliari at the end of the season. 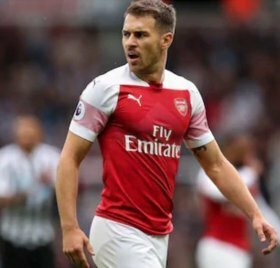 Arsenal have been dealt a major blow in their pursuit of a top-four position in the Premier League, with news that midfield star Aaron Ramsey has withdrawn from the Wales squad to face Slovakia. Ramsey, who is to move to Juventus at the end of the season on a free transfer, has also missed Wales' last friendly game against Trinidad and Tobago. Arsenal midfielder Denis Suarez has hit out at rumours that Unai Emery is unhappy with performances of the on-loan player, with Suarez insisting he is performing well and slamming the reports on his own personal Twitter account. Emery worked with Suarez at Sevilla. Juventus have reportedly joined Real Madrid in the race to lure midfielder N'Golo Kante from Chelsea during the forthcoming transfer window. Arsenal and Manchester United are reportedly keeping a close eye on the proceedings of midfielder Isco, who has endured a tough season with Real Madrid this term.